Brookville, NY—LIU Post was recently recognized by the Phi Theta Kappa Honor Society as one of the top four-year universities in the country for creating dynamic pathways to support community college transfer students. Phi Theta Kappa (PTK) is the world’s largest and most prestigious honor society for two-year college students. 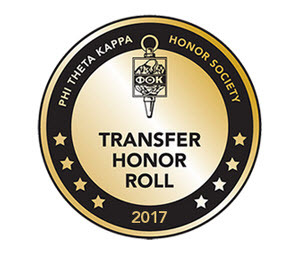 LIU Post is among just 65 colleges and universities recognized as members of PTK’s 2017 Transfer Honor Roll. LIU Post was honored last month at the PTK Convention in Nashville, Tennessee based on its programs that support transfers, including: increasing the number of Phi Theta Kappa scholars into the University’s Honors College, creating a policy to respond to transfer student admission applications within 48 hours, and providing dedicated academic and admission advisors to transfer students. Additionally, LIU Post was recognized for instituting the LIU-PTK Honors Scholarship Program, which provides one of the nation’s highest academic merit scholarships to PTK transfer applicants with a GPA of 3.5 and higher. Transfer students considering their next step can learn more at LIU Post’s Transfer Registration Night on Wednesday, May 17 from 5:30-7:30pm in the B. Davis Schwartz Memorial Library. For more information, students can contact LIU Post Transfer Admissions at 516-299-2900 or email post-transfer@liu.edu.